J I Packer explains that “MEDITATION is the activity of CALLING TO MIND, and thinking over, and dwelling on, and applying to oneself, the various things that one knows about the works and ways and purposes and promises of God (found foremost of course in the Scripture)…It is an activity of holy thought, consciously performed in the presence of God, under the eye of God, by the help of God, as a means of communion with God.” And I would submit the best way of “calling to mind” the Scriptures is to first place them in our mind by intentional memorization. Are you actively MEMORIZING Scripture? If you are not, you will find it difficult to meditate on Scripture “day and night” as advocated in Psalm 1. Cows chewing cud are often used as an illustration for Biblical meditation. Cows eat the grass and then settle down for a good, long chew. They bring the food back up from their stomachs and rework what they’ve already eaten, assimilating its goodness and transforming it into rich milk. Time-consuming? Yes. A waste of time? Not if they want to give good milk! So too, reading snips off the grass, while meditation chews the cud! God’s Word is not meant to be fast food, so take time for a good long chew. 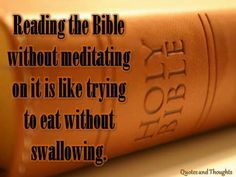 Indeed, reading the Bible without meditating on it is like eating without chewing. What digestion is to the body, meditation is to the soul. As John Piper observes one of our greatest weaknesses in our digital age “is that we do not meditate on the great things of God. Our lives are unbelievably distracted. We are experts at multi-tasking, surfing, and skimming, but it is harder than ever to MEDITATE. Therefore, it is imperative to intentionally cultivate MEDITATION on God’s Word. But how? I call it “going out to pasture”—resting and ruminating (like a cow chewing) on the Word of God, savoring it for the sake of life. If possible, find a consistent time, place, and plan. Then read slowly and carefully. Reread and reread. Read out loud. Read prayerfully. Read with a pen in hand. Memorize texts that you read.” Indeed, memorization is a first step to meditation. You cannot chew what you have not placed in your mouth! Spurgeon adds that “Meditation and prayer are twin sisters and both of them appear to me equally necessary to Christian life. I think meditation must exist where there is prayer, and prayer is sure to exist where there is meditation.” Indeed, meditation fits a man for supplication! This entry was posted in Bible Teachings, Inspirational Messages and tagged christian, delight, God, god's word, meditate, Promises, prosper, read, Scripture, think. Bookmark the permalink.